Atlanta: Tiger Woods charged to a four-stroke lead halfway through the third round at the Tour Championship on Saturday amid scenes reminiscent of his halcyon days. After starting the day tied for the lead with Justin Rose, 14-times major champion Woods putted brilliantly to record six birdies in the first seven holes at East Lake in Atlanta. However, he subsequently bogeyed the ninth after a poor tee shot and completed the front nine in 30 strokes. He turned at 12 under par, while world No. 1 Rose was a distant second on eight under. Woods, whose 79 PGA Tour victories leaves him three short of the record held by Sam Snead, has not won since 2013. Woods, 42 looked in a class of his own as he carded a five-under-par 65 to leave himself on 12 under for the tournament at Atlanta’s East Lake course. 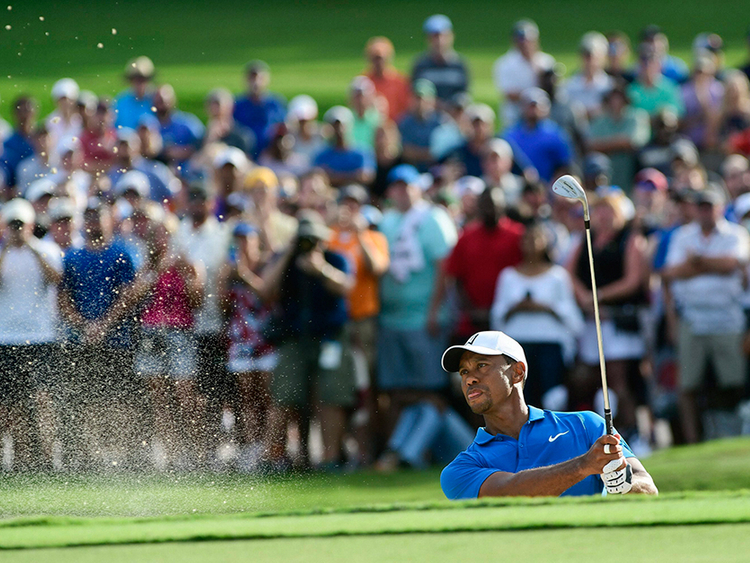 With one round remaining, Woods leads by three from Rory McIlroy, who moved to nine under with a four-under-par 66. Woods’ last victory came 1,875 days ago in August 2013 when he captured the WGC-Bridgestone Invitational. However Woods has progressed steadily during his comeback season, leading the British Open during the final round in July before finishing second at last month’s PGA Championship. He fired a 62 earlier this month and has also done enough to force himself into the USA team for next week’s Ryder Cup. Justin Rose knows the overwhelming majority of fans will be cheering for Woods, so it might be a blessing that he will not be paired with the American in the final group. “Now people really enjoy watching him play. And that’s why everyone is rooting for him tomorrow absolutely, except maybe for the other guys on the leaderboard.” Rose will be playing not only for the victory but also the FedExCup, which is worth $10 million to the winner of the season-long PGA Tour points race. For all their achievements, 2013 US Open champion Rose and four-times major winner McIlroy know that beating Woods would be a career highlight.